LEXINGTON, KY, June 16, 2009 — As part of a key initiative to bring equestrian vaulting to the home of the Alltech FEI World Equestrian Games, the American Vaulting Association (AVA) will host a series of “Introduction to Vaulting” summer day camps and clinics in the greater Kentucky area throughout July. The top U.S. coaches and equestrian vaulters will teach participants dance and gymnastics routines on a moving horse. “Our goal is to introduce this exciting and growing sport to Kentucky and surrounding states this summer, and to give riding instructors and equestrian facilities the tools to start 20 new vaulting programs throughout the region within the next year,” said Sheri Benjamin, AVA president. The camps will be held July 13-15 at the Meadow Lake Equestrian Center in Lancaster, and July 20-22 at the Kentucky Equestrian Center in Winchester. The cost for both instructors and athletes is $150 for the three-day session. The on-site clinics may be scheduled by request. During each three-day camp, the AVA will run dual tracks: a “train the trainer” program designed to teach riding instructors how to coach vaulting, and an “Introduction to Vaulting” camp for riders and athletes who want to learn the sport. Vaulting is an excellent equestrian activity to help riders develop a better seat, posture and communication with the horse. For non-equestrian athletes, including gymnasts and dancers, vaulting helps improve overall balance, flexibility and core strength. For those who prefer a custom session, the AVA is offering on-site half-day clinics throughout July, designed to bring vaulting directly to equestrian facilities in the greater Kentucky area, including the surrounding states. The AVA will provide coaches, vaulting horses and all equipment necessary for these sessions. To register for the camps or to get more information on the on-site clinics, click on the “Kentucky Camps and Clinics” button on the American Vaulting Association website (www.americanvaulting.org) for an on-line brochure, or call the AVA National Office at 323-654-0800. Vaulting is both a recreational activity and a competitive discipline where both gymnastic and dance elements are combined and performed to music on a walking, trotting or cantering horse. It requires a harmonious relationship with the horse and outstanding physical condition from the vaulter. An FEI recognized discipline since 1983, vaulting competitions are held regionally, nationally and worldwide and individuals, pairs and teams all compete in separate events. This variety creates an engaging experience for spectators as they watch athletes of all ages perform breathtaking routines that include artistic mounts and dismounts, shoulder stands and handstands on the horse, carrying or lifting another vaulter, and kneeling and standing exercises. Vaulting is a unique and growing sport with a rich heritage traced back to the ancient Minoans and later to Roman soldiers. It was featured in the 1920 Olympic Games in Antwerp as Artistic Riding and has since evolved into the sport it is today. Vaulting is a wonderful way to develop coordination, balance, strength, and creativity while working in harmony with the horse; it is used around the globe as an introduction to the equestrian world and is recognized as a technique for developing strong riders in all disciplines. The American Vaulting Association, a 501(c)(3) non-profit organization, is dedicated to growing vaulting in the United States through educational programs, activities and competitions. This year the AVA celebrated its 40th anniversary; it has hundreds of vaulting clubs around the nation, and hosts dozens of activities and competitions annually. For more information go to www.americanvaulting.org or call the AVA National Office at 323-654-0800. 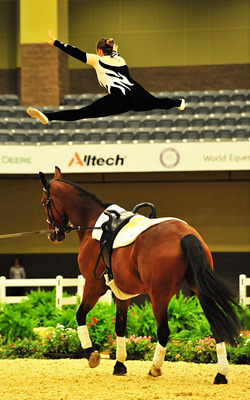 For more camps/clinics information go to http://www.americanvaulting.org/Kentucky/camp/index.php. To see vaulting, go to http://www.americanvaulting.org/seevaulting/videos.shtml.